If you’re having problems with a business deal that’s soured, an unresponsive landlord, or the guy who totaled your car, you can turn to the courts for relief. But if you think there is only one way to proceed, think again. In this country, there is a tradition of self-help law that is as much a part of our heritage as mom, apple pie, and the American flag. It’s called pro se—legal self-representation—and it may be the answer for you. 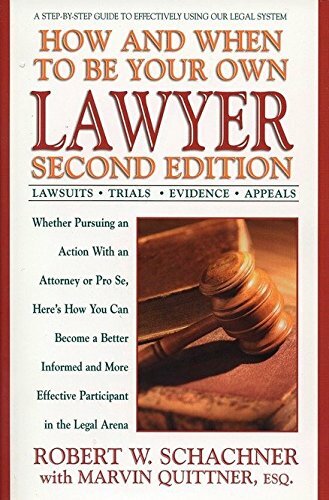 In this, the updated second edition of How and When to Be Your Own Lawyer—one of the most successful self-help law books ever published—authors Robert Schachner and Marvin Quittner, Esq., provide the average person with a no-nonsense guide to using the American legal system. Written in plain English, How and When to Be Your Own Lawyer leads you through the maze of legal processes principles—step by step—from making a realistic appraisal of your case to collecting a judgment. It provides information on drawing up a complaint, using a law library, devising strategy, assembling evidence, filing motions, and preparing and presenting your case in court, including advice on how to deal with an opposing attorney when proceeding pro se. The authors also offer clear explanations of legal terms and historical background that helps to make sense of many puzzling aspects of the law, all highlighted by real-life case histories.